Carlene West was born in southern Spinifex country at Tjitji and moved to the mission of Cundeelee as a teenager with her parents. This became home to many Spinifex people as they were forced off their country due to the British nuclear testing at Maralinga. At Cundeelee West married Fred Grant, and they became integral to the movement for a return to country. 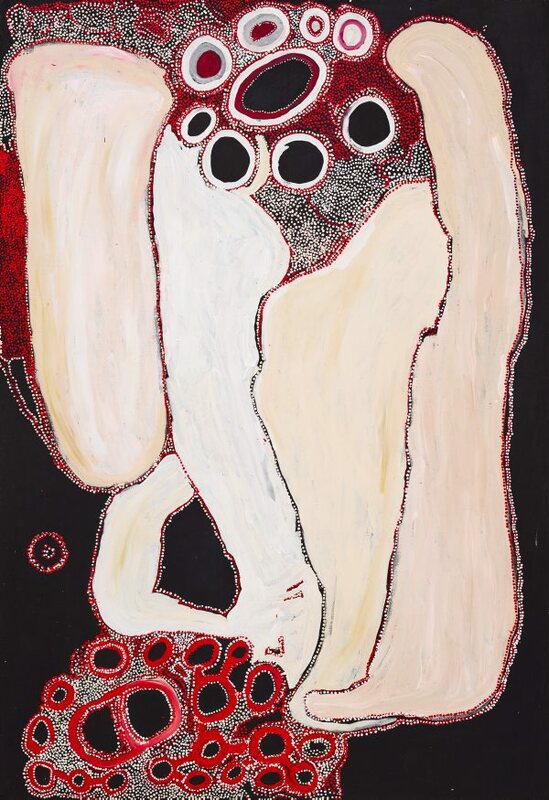 Art played a vital role in this process and West contributed to all of the women’s collaborative works that documented the innate connection the Spinifex people had to their country which were used as evidence in their Native title claim. 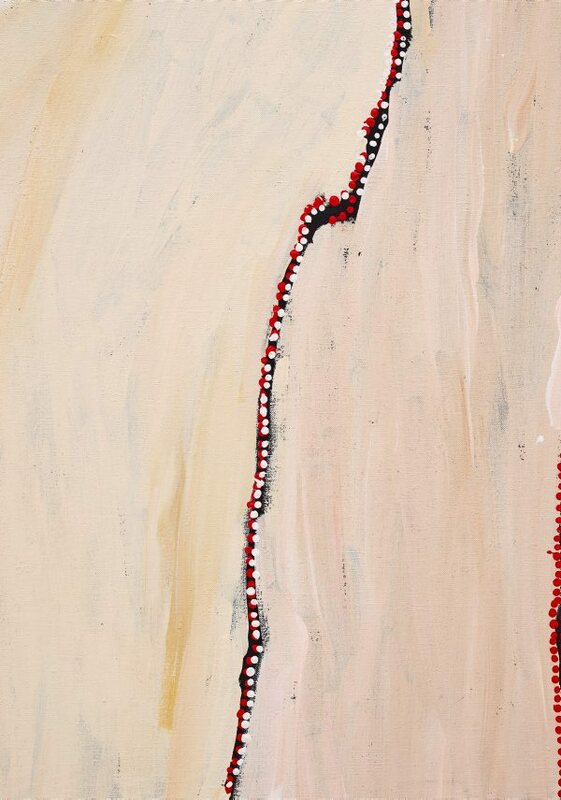 Throughout her painting career West has given form to Tjitjiti where she was born. In early works she represented this vast, elongated, salt lake ringed by tawny sandhills in the manner of the visual language of the Western Desert region, which has become synonymous with the artists of Papunya Tula. However, from around 2012 as West slipped into a gentle form of Alzheimer’s, she has given gestural form to the lake in textural brushwork of stark whites and creams and laced with traceries of fine red dotting, floating on a void of blackness. 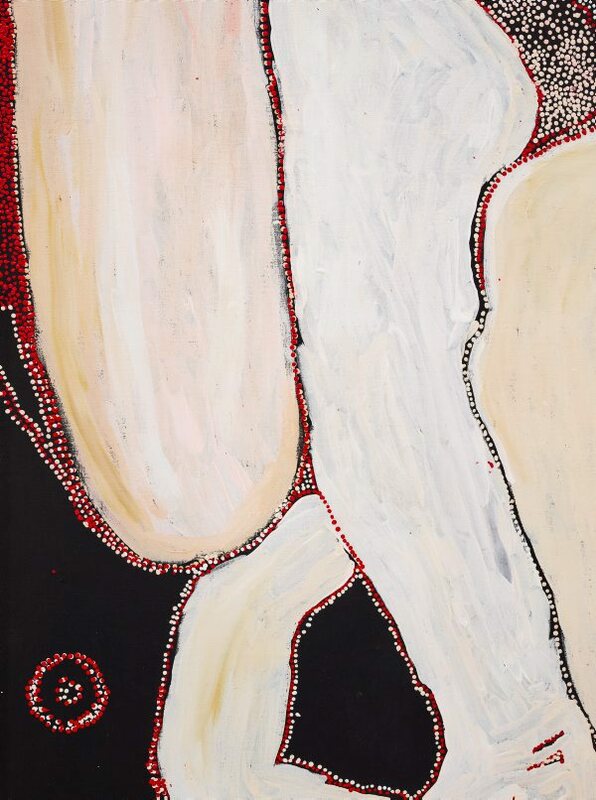 ‘Tjitjiti’ 2014 is an exceptional work by West that balances elements of her earlier style of bold red circular forms set amongst a field of brilliant white dots, alongside an expressive representation of the lake. Segmented into four the lake the subtle shifts of colour employed across the form of the lake, evoke the vivid glare of its salt encrusted surface, through to the tawny sandhills that mark its border. Nyangatja ngayuku ngura ka ngura panya ini Tjitjiti ka Tjitjitiku Tjukurpa Minyma Kutjarangku tjtji kutju katinyi tjina wati Tjitjitinya ka nyara maliki Wati Kuninka altingu "tjitji kutju ngalya kati' ka panyaya wirtjapakanu ka watingku kulata wakani minyma kutjara tjungu ngaranyi iluntananyi tjitji kulu ngaltaltjara ka kuwari minyma kutjara nyupali tjitjiti ngaranyi. This is a painting representing my country of Tjitjiti a large salt lake. It is the site of the ancestor women. Here the Two Women are walking across the big salt lake with a child when they are called by a stranger, a Quoll Man, to hand over the child. The women run to escape but the Quoll Man threw many spears and eventually one hit, impaling the two women, together with the child. This is a sad story. The two women can still be seen today standing at Tjitjiti. Valley where he passes away.